A Jewish Autumn in Kochi: Simchat Torah and other celebrations! 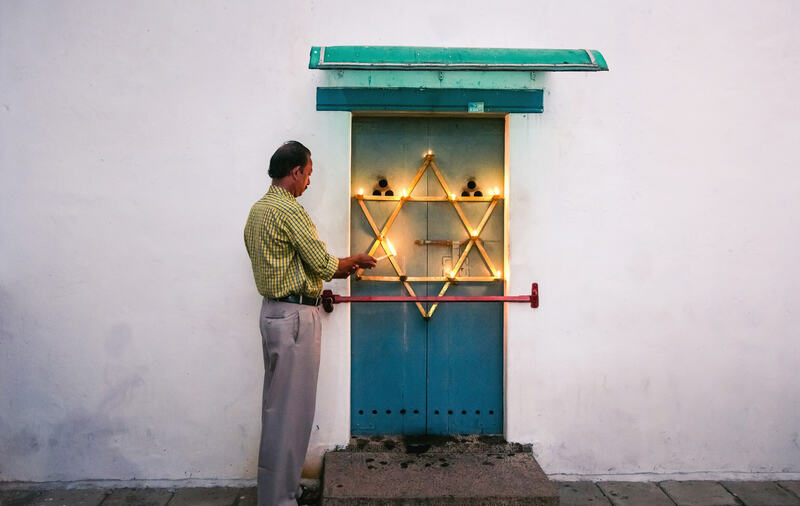 Celebrating the Jewish Fall Festivals - Rosh Hashanah, Yom Kippur, Sukkoth and Simchat Torah - with Cochin Jews, a small community trying hard to keep alive the most sacred and revelous days of Jewish life in Kochi. Back in the day when Jew Town was the lively Jewish quarter of Kochi, the closely spaced homes on either side of the cobbled street eagerly awaited the arrival of the autumn month of Tishri. As August wrapped up the last remaining Monsoon showers and September mornings dawned bright and clear in the eclectic streets of Mattancherry, the Tamil Brahmin households stocked dolls for Bommai Kolu, Gujaratis perfected their whirls for Dandiya Raas, the Muslim enclave prepared for Muharram fasting and, with the ritualistic blowing of horn trumpets, their Jewish neighbours counted the days until the onset of Tishri, the sacred month that evoked the most pious and festive days of Jewish life in Kochi. The Jewish new year, Rosh Hashanah, falls on the first day of Tishri and the holiest day of the Jewish calendar, called Yom Kippur, is on the tenth day. 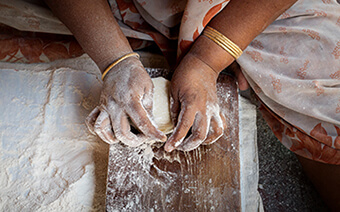 It is customary to observe forty days of morning prayers till Yom Kippur and clean the houses and home-bake cakes in preparation for Rosh Hashanah. For many years, Jew Town dwellers religiously followed these practices. After the Jewish homeliness of this little town diminished and made way for the hustle of antique shops, the festivities have reduced considerably. 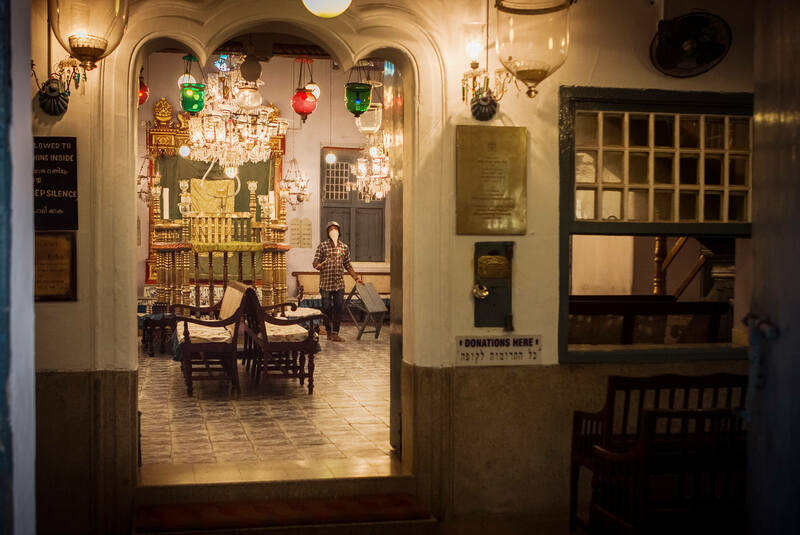 But, by virtue of the only functioning synagogue in Kochi, the Paradesi Synagogue, and a small group of congregants performing this mitzvah, the Jewish High Holy Days are still a part of the festivals of Kochi. On Jewish High Holy Days, Jew Town, with its people and their synagogue dressed in white, is blanketed by a serene and joyous air. Blowing of Shofar, a horn trumpet used for Jewish religious purposes, is an important part of Rosh Hashanah services. Cochin Jews welcome the new year with sumptuous ceremonial meals. 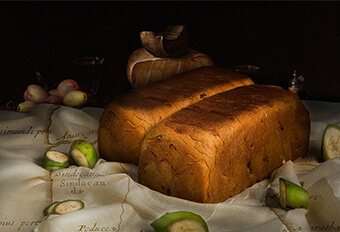 Special sweet dishes are prepared for the occasion. In contrast to the festivities of Rosh Hashanah, the Day of Atonement, Yom Kippur, calls for solemn ceremonies in the synagogue. 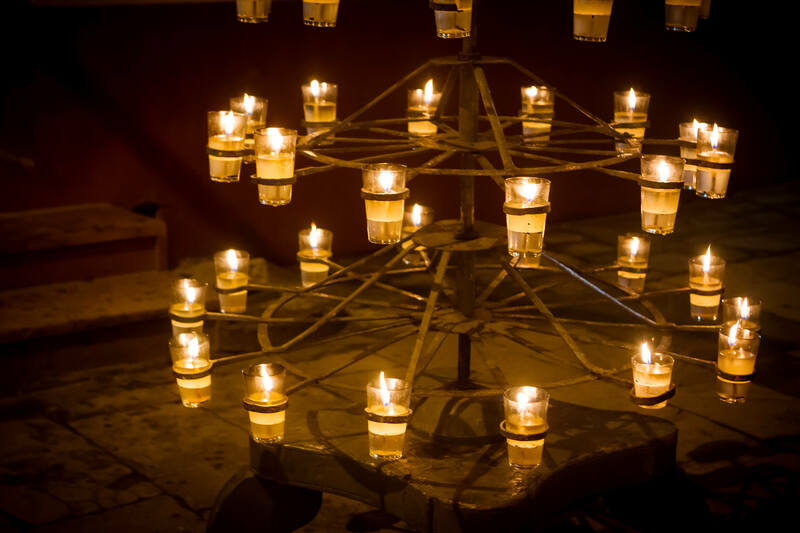 During the 26-hour fast on Yom Kippur, the sanctuary is lit by candles and oil lamps only. 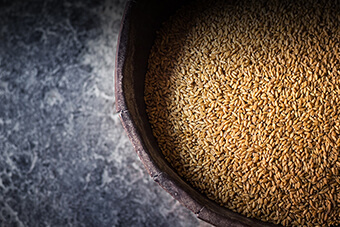 After Yom Kippur comes the third and the final Fall Feast called Sukkoth or the Feast of Tabernacles. ‘Sukkah,’ a pandal with roofing of braided coconut palm fronds, is a distinctive feature of Sukkoth. Jews observe the feast in the Sukkah. In the past, Sukkahs were constructed in all the houses of Jew Town and the synagogue had a more elaborate and decorative Sukkah for the community. These days, only the Sukkah in the synagogue yard is built. 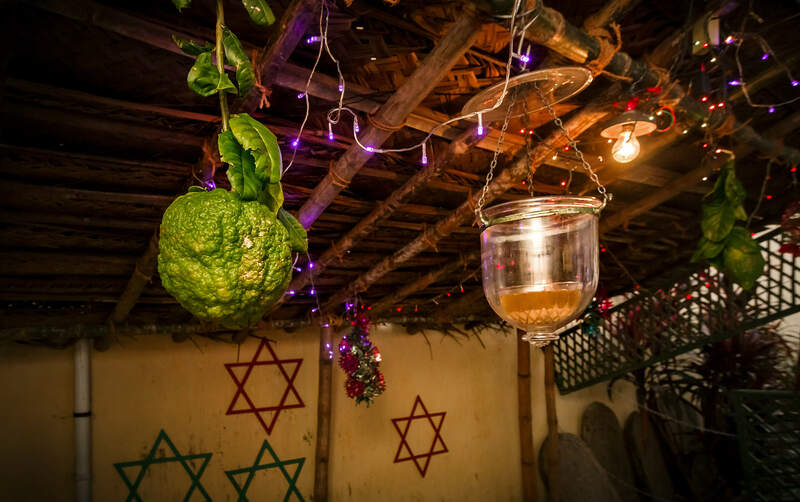 This Sukkah is decorated with Star of David motifs and colourful foil lanterns and citrons, one of the Four Species mentioned in the Torah for Sukkoth rituals, are hung from the roof. The Torah is the core of all celebrations and ceremonies of Shmini. 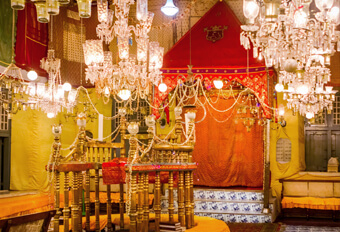 On these days, the interior of the Paradesi Synagogue, especially the Torah Ark, is decorated with bright and lustrous ornamentation. 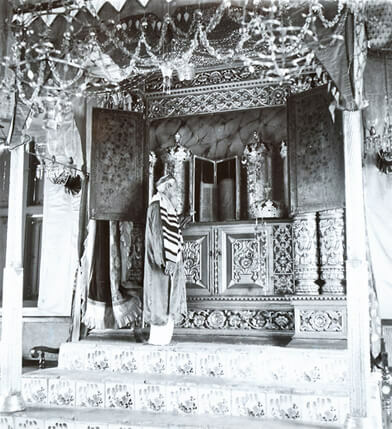 An old photograph of the decorated Torah ark in Paradesi Synagogue. The grandest of celebrations of Cochin Jews is saved for the end of Tishri. Simchat Torah, a festival that marks the end of a season of public Torah reading and the beginning of the new season, is a jubilant conclusion of the Fall Feasts. Though the number of Jewish residents in Jew Town has reduced to a handful, Simchat Torah still brings cheer and verve to this single-street town. With each passing year, forming a minyan, which is a quorum of 10 Jewish adults required for a public prayer, becomes increasing difficult and until the time of prayer, uncertainty loom large in the synagogue. 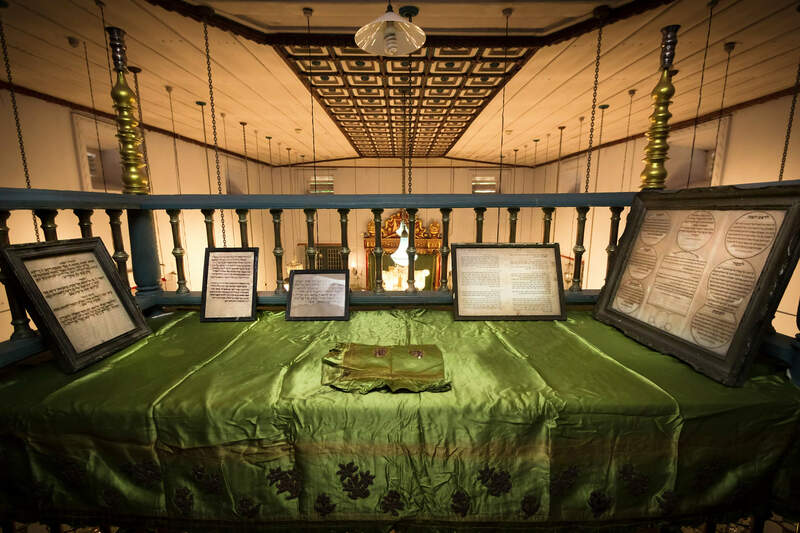 With a few of the expatriate Cochin Jews coming home to a community they love so dearly and tourists dropping in to celebrate their love of the Torah, this year too, the Paradesi Synagogue hosted the coveted Torah readings on a highly auspicious day in the life of the Jews of Cochin. The Sukkah in the courtyard of Paradesi Synagogue, decorated with citrons, Star of David motifs and colourful foil lanterns. 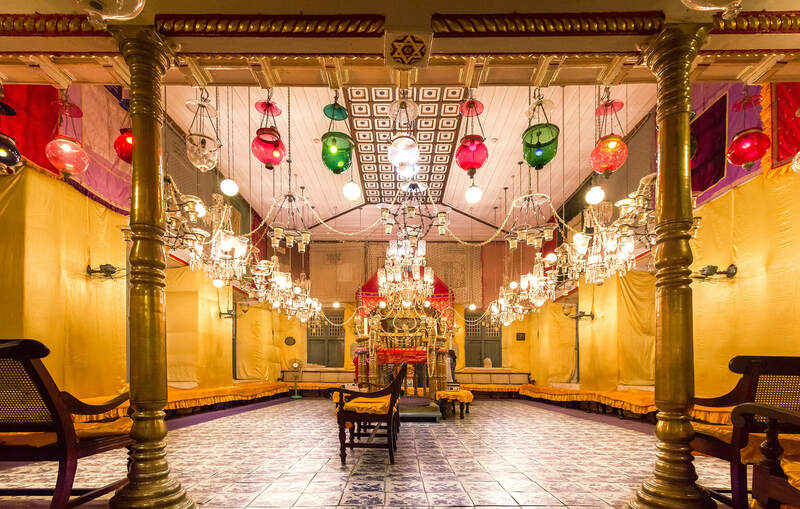 The bright and lustrous interior of Paradesi Synagogue on Shmini days. The elaborate candelabra embellishing the synagogue on Shmini days. 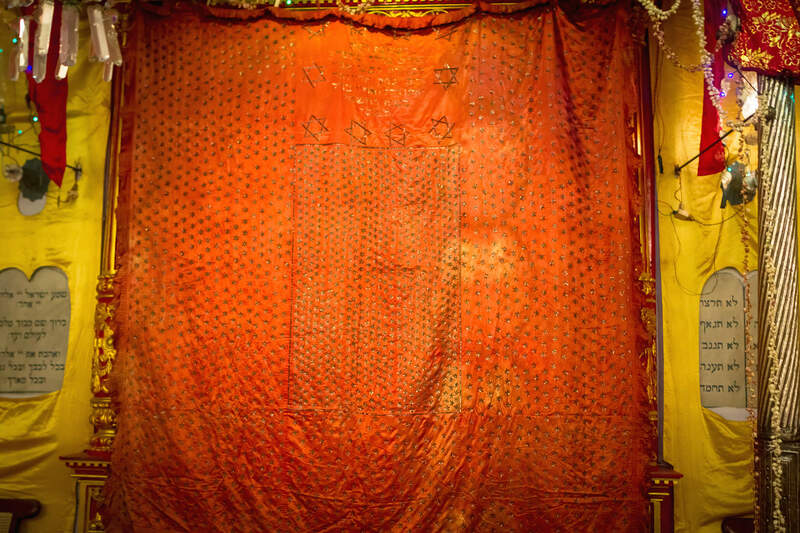 The ornamental ark curtain (parochet), made of red and gold brocade, covering the Holy Ark in Paradesi Synagogue on Shmini days. In Kochi, like in many other communities of the diaspora, Simchat Torah is the second day of the two-day festival of Shmini. The Torah is the core of all celebrations and ceremonies of Shmini. On these days, the interior of the Paradesi Synagogue, especially the Torah Ark, is arrayed in bright and lustrous ornamentation. The Torah Ark, called aron kodesh, placed centrally in the main wall of the synagogue, is covered with a temporary structure. This tall structure, draped in red and gold silk brocades, resembles a mandap. Inside the ark, the seven Sefer Torahs are placed. Sefer Torahs are handwritten copies of the Torah, housed in metal cases and adorned with gold crowns and chains. On both days of Shmini, Sefer Torahs are taken out of the ark and worshippers carry them around bema, the platform for reading the Torah. These circumambulations, called hakafot, typically involves singing, dancing and other merriments. As hakafot begins on the first evening of Shmini and continues through Simchat Torah day, Jewish prayer tunes peculiar to Jews of Cochin ring out in the silence. 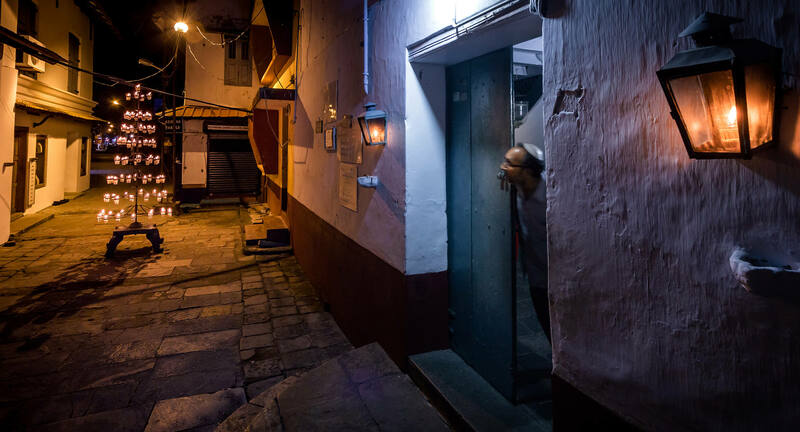 The feeble tunes lingering in the synagogue yard is a sentimental throwback to the religious piety and endless revelries that once defined the very essence of the Fall Feasts in Paradesi Synagogue. Besides the ark, the brightly coloured, ornate tapestry and elaborate candelabra embellishing the synagogue contribute to its sublime beauty. The walls and seating are covered with golden yellow satin and embroidered ark curtains, called parochet, are hung from the top edges of the walls. Swags of jasmine flowers decorate the bema and the chandeliers. 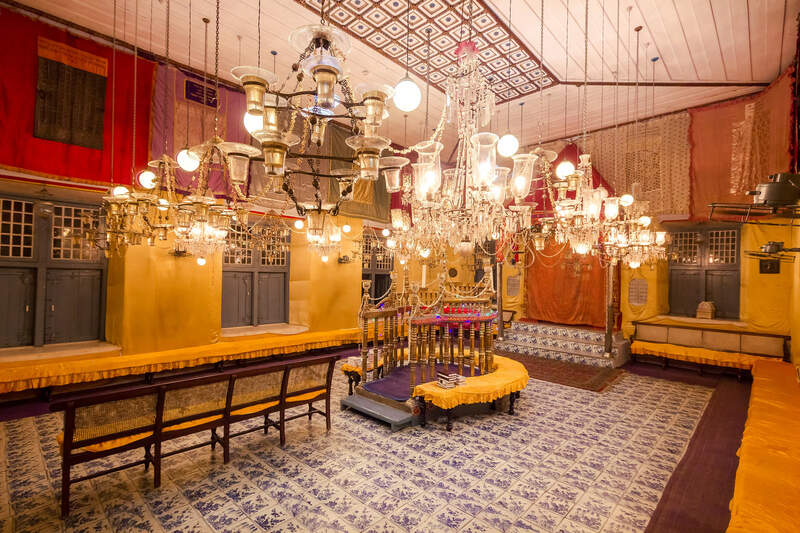 As dusk falls, the decorations catch the light of the chandeliers — not a single lamp is left unlit on Shmini evenings — and a heavenly glow is cast upon the inner sanctuary of Paradesi Synagogue. Illustration of Sefar Torahs of Paradesi Synagogue. with gold crowns and chains. 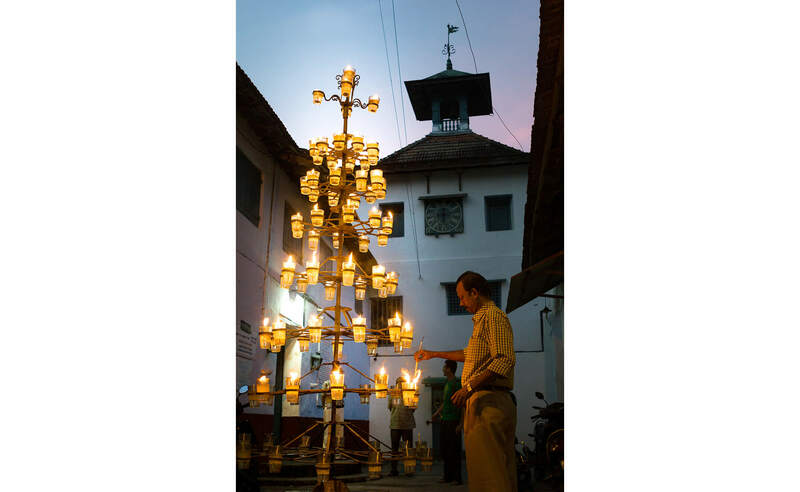 A similar spectacle of lights can be seen outside the main entrance of the synagogue — a 12-foot metal lamp with 82 lights, called Aalvilakku. This conical structure has eight circular rows that taper towards the top. The rows have holders for glass lamps. Each glass lamp has a long wick in the centre and is filled up with a mix of coconut oil and water. The 82 lamps are said to be representing the 82 families who occupied the town in the past. 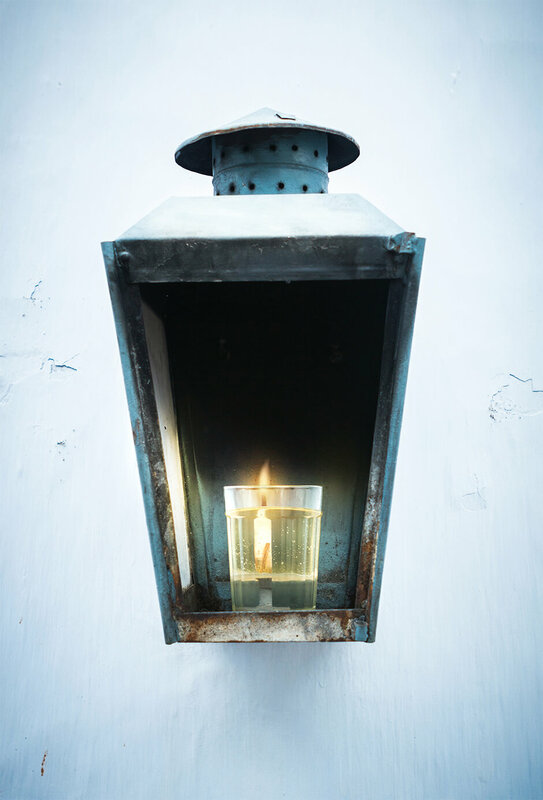 A much smaller candelabrum, shaped like the Star of David and mounted on a tiny door at the foot of the clock tower of the synagogue, is also lit. The astonishingly beautiful synagogue decoration is a divine sight that has stood the test of time. 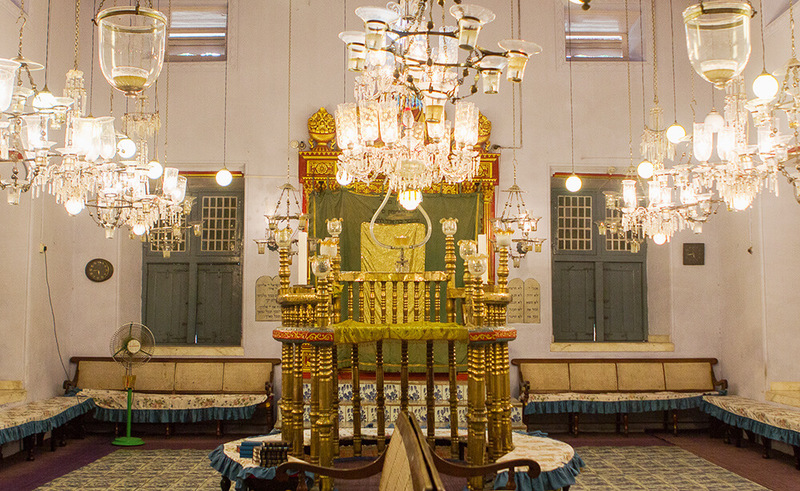 Compared to old times, the gloss and grandeur might be a lot lesser but even today, the synagogue on Shmini is an awe-inspiring display of the valuable legacy of Cochin Jews. These precious ceremonies are also a way for the non-jewish population of Kochi to remember and honour the Jewish autumns in Kochi. Many non-Jew Kochiites continue the practice of visiting the Jew Town on Simchat Torah and witnessing the lighting of aalvilakku. Nowadays, when Simchat Torah concludes with the dismantling of the temporary ark, an inevitable question arises — who all will be there to form the minyan next year? 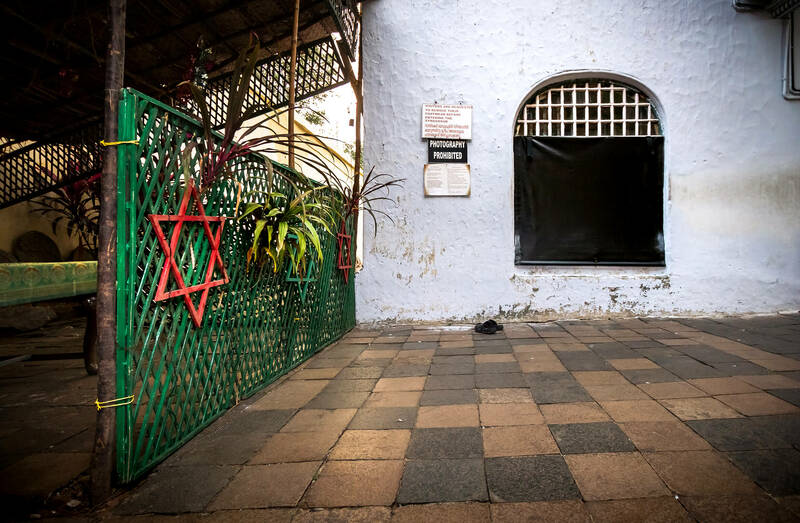 A small number of Cochin Jews - those who stayed back to make Kochi their home and some others who come back home to Kochi for holidays —are trying hard to keep alive the joy and sanctity of Jewish autumns in Kochi. Their non-Jew friends also help this community in preparing for various ceremonies. 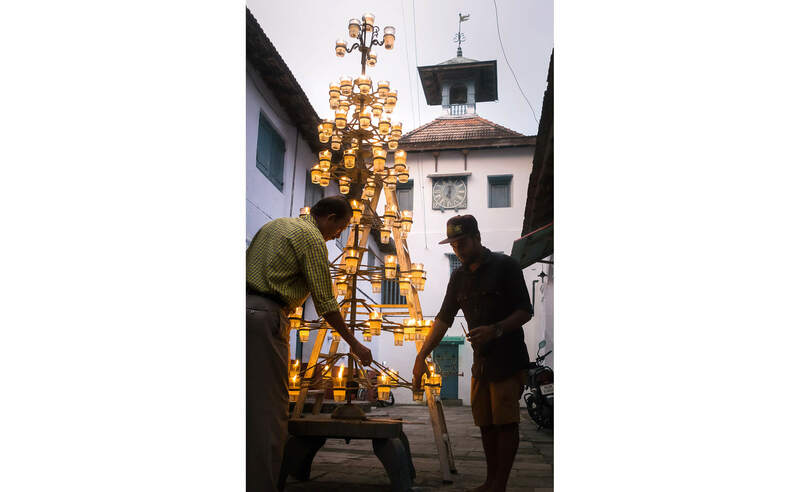 The synagogue decoration and lamp lighting for Simchat Torah is done by Joy, the non-Jew caretaker of Paradesi Synagogue and a group of young men from the locality. Joy inherited the caretaker’s role from his father and like Joy, there are several others who have been linked with the Jewish community for many generations. 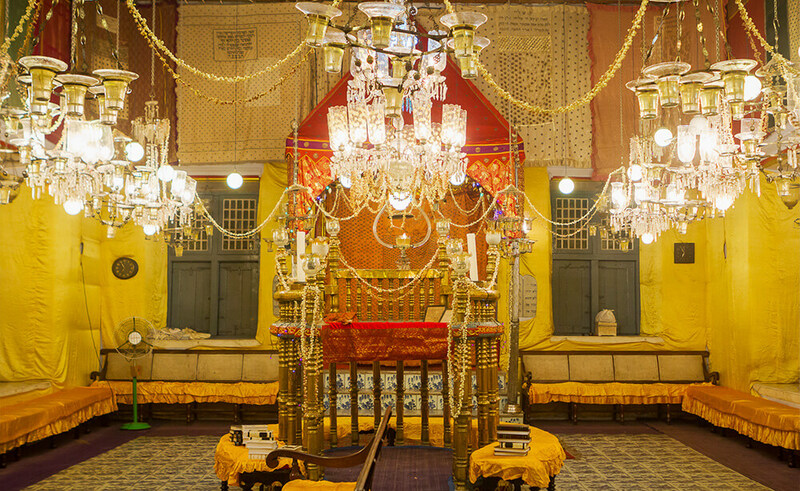 A comparison of the decor of Paradesi synagogue for Simchat Torah with that of usual days. Move the slider to see the appearance before and after Simchat Torah decorations. Even today, the ethnic plurality and the peaceful co-existence of varied communities within a small geographical area for many centuries makes Mattancherry a cultural gem in the map of Kochi. Jew Town and its people are an integrant part of this cultural identity. However uncertain the future might seem, in both conspicuous and inconspicuous ways, Jewish autumns will continue to arrive in Kochi. A big thank you for all the people who has helped us to tell this story!